"I received a call from one of my staff yesterday while I was on an assignment that one of my students has been shocked by electric, that I should rush down to the clinic immediately, on reaching the clinic. I only came to meet his dead body. On getting back to my school, after some findings, I discovered that incident happened while he was trying to charge his phone according to another student by the name lucky who witness the incident. 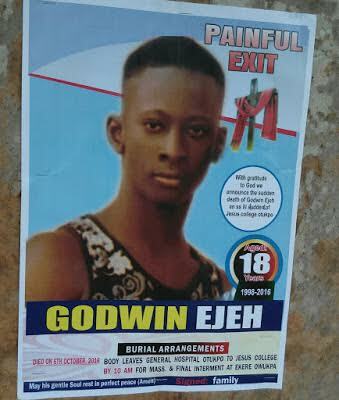 I sincerely sympathize with the family of deceased and I pray his soul rest in perfect peace. Amen,"
He was laid to rest yesterday 7th October, in his hometown Ekere Owukpa, Ogbadibo local government area of Benue state.